This time of year there is A LOT. So many projects to complete, cards to write, gifts to cleverly brainstorm, buy, and wrap...parties to gussy yourself up for...regaling of your work and whereabouts to family...then throw into the mix plummeting temperatures and our immune system cries out, "This is A LOT!" Don't get me wrong, I raise massive prayer hands for the aforementioned (though I could kick winter's chill to the curb). We should all be so lucky to have curious family, parties to feel exhausted by, and gifts to wrap until midnight leaving us with paper cuts. These are real #blessings. I've decided that when I have a small family of my own, I would like to create the holiday tradition of gifting a single physical gift under a gaudy silver tree, and then forgoing all of the bustle in favor of a travel experience. Like a long stay at Madonna Inn or Dunton Hot Springs...mood depending. I grew up with a mom that worked her tail off everyday. I could endlessly list how she gave and gave of her time and energy, and question, "How the hell did she do it?" But after all it was her moxie, which can be summarized by the image of a woman who -at the end of a long work day, after biking 7 miles to and 7 miles from the office- cooked dinner while dancing and playing (loud) some Stevie Ray Vaughan. I've recently re-fallen in love with roses. Their bushes bestow such a wise metaphor for balance, with thorns acting as cautionary reminders to not clench beauty so tight, not hold it so dear, not dote upon it so. (topically healing) astringent and antiseptic properties prevent bacteria from spreading and infections from developing. I'm over the moon to begin my journey into cosmic cookery with The Moon Juice Cookbook. 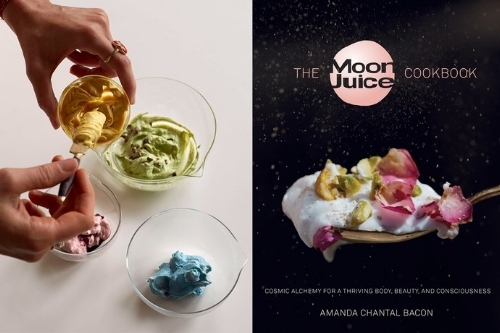 Amanda Chantal Bacon, founder/CEO of Moon Juice and priestess of alchemic creations is badass embodied, as evidenced in her interviews here (listen) and here (read). Despite my days of official ballet lessons being far behind me, I'm an unapologetic proponent -and nearly daily wearer- of leg warmers. The time has come to upgrade material, cover more limbs, and get freakin fancy with cashmere arm warmers! Ya heard right.